Magnetisation is transferred from 1H to 15N via cross polarisation and then selectively to the 13Cα using specific cross polarisation. A PDSD or DARR step is then used to transfer magnetisation to any other 13C nuclei nearby. The chemical shift is evolved on the 15N and 13Cα nuclei and then detected on 13C, resulting in a 3D spectrum. A 2D version in which the 13Cα evolution time is left out is also possible. When recorded with short mixing times for the CX step (10-50ms) this experiment is very useful for the identification of spin systems, i.e. all 13C and 15N resonances belonging to a single residue. 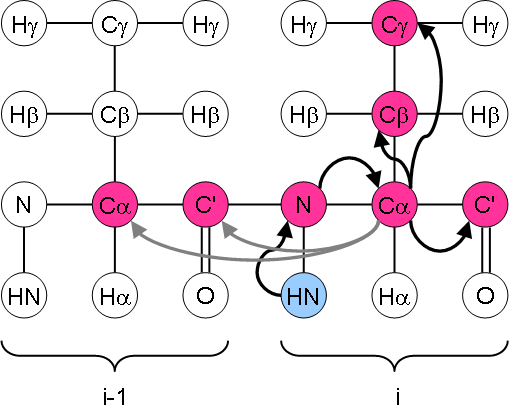 When using longer mixing times (200-500ms) it is possible to see links to other carbon atoms nearby and restraints for structure calculations can be obtained, or links to neighbouring amino acids can help with assignment.